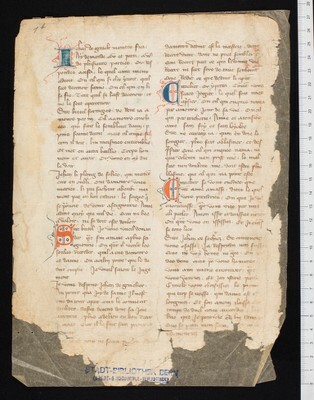 Fragment of a 14th century French Trouvère manuscript. It contains 18 jeux-partis (17 with the participation of Jehan Bretel) and a fragment of the Prise amoureuse by Jean Acart de Hesdin; all chansons except for one are attested in the parallel version. The songs have been transmitted without notation.